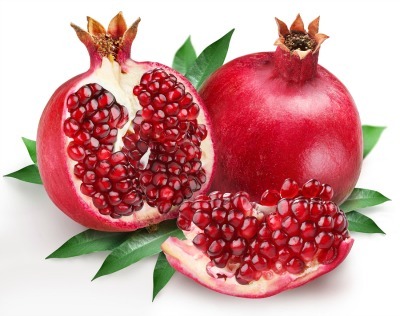 Pomegranates are considered to be one of the oldest fruits known to man. In fact so old it has been praised in the Old Testament of the Bible in the Song of Solomon 7:12. It is believed that this fruit originated in Iran, Iraq and Northern India and as time went on spread to areas of Asia, Africa and Europe. Of course today this bright red fruit are grown in many areas which offer a warm and fairly dry climate. Places such as Mexico, West Indies, Bermuda, South and Central America along with areas in the United States such as Florida, Arizona, California and Texas. From long ago there has been many uses and believes about this healthy fruit. It has been used as a dye due to its beautiful ruby color and was considered a sign of fertility in Persia and China. The fruit itself grows on trees (or large bushes) and varies in size between a small apple and a grapefruit. The seeds (also known as arils) found within this fruit are crunchy outside and juicy inside offering a tangy sweet burst of flavor. In every pomegranate the seeds within are protected by its thick purplish-red leathery skin which is not fit for eating. Then inside the fruit these seeds are connected by a white pithy membrane. Once you have managed to clean one you are left with hundreds of nutritious seeds for eating. Vitamin C contains antioxidants that strengthen the immune system and helps the body absorb iron which is needed in the production of red blood cells and proper levels of oxygen intake. Of course this vitamin offers many other benefits such as the production of collagen and elastin which helps keep us looking young. It also helps keep our bones and connective tissue healthy and helps prevent cataracts of the eye. Vitamin E is also a strong antioxidant. Vitamin K helps keep our bones strong which helps prevent osteoporosis. This fruit is low in calories yet high in fiber which is helpfull with weight loss and prevents constipation. Phytonutrients are derived from plants and are essential for human life. They are also an antioxidant, anti-inflammatory and are considered to be a liver loving food. Pomegranate juices contain high amounts of antioxidants which are extremely important as they reduce the everyday cell damage our bodies encounter from the environment we live in. Antioxidants help detoxify the body reducing cell damage which helps slow down the aging process, help us maintain good health and assist in disease prevention such as cancer. First cut the stem end off the fruit taking care not to cut the seeds within. Take a knife and score the fruit into quarters from top to bottom, scoring it deep enough to break its’ leathery skin. Now place the fruit into a bowl of cool water and underneath the water separate the sections with your hands. This helps keep red juice from spattering everywhere keeping the mess at a minimum. Once the sections are apart then you can easily separate the seeds from the skin and white membrane with your fingers. The seeds will sink to the bottom but the white pieces of membrane will float to the top. Skim off any membrane pieces with a small sieve. Now scoop the seeds out of the water. The seeds are now ready to eat or to be stored in the fridge for later use. Today the pomegranate is used in countless recipes such as homemade soups, jams, jellies, baked goods, frozen desserts, fresh juice, on salads, making grenadine and many others. It is also just a healthy fruit eaten by many to keep the immune system strong to help fight disease.